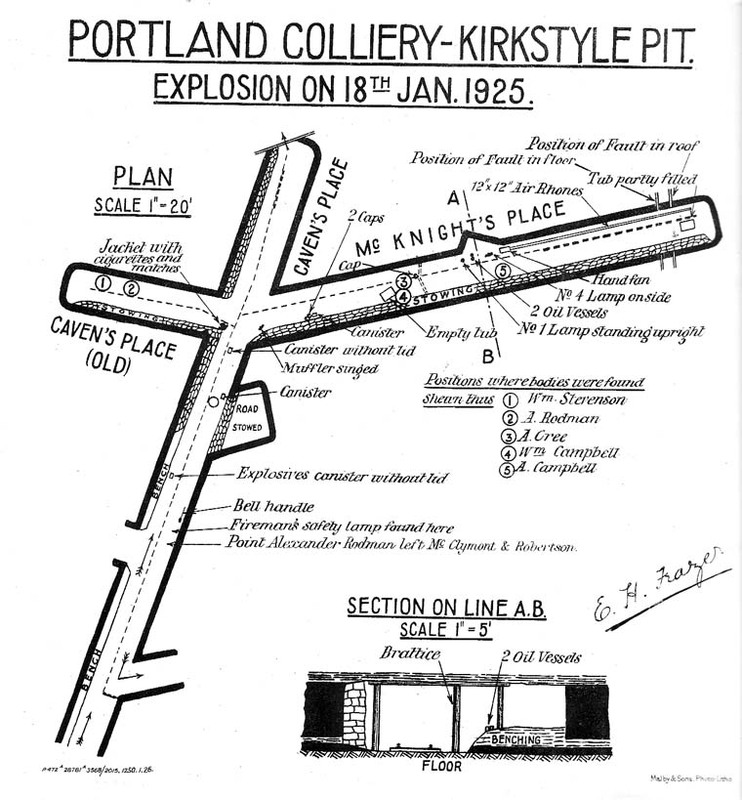 At Portland Colliery, Kirkstyle Pit, Ayrshire, an explosion of gas occurred on Sunday night, January 18th, and resulted in the in the death of five persons. The upcast and winding shaft had levels at 64 fathoms to the McNaught Seam, at 70 fathoms to the Tourha' Seam, and at 81 fathoms to the Major Seam, but only the two upper levels were working. From the top level a road led to a section of Major Coal, which was known as the McNaught Major because it was worked from the McNaught Seam level. The section was at the return end of the ventilating current and Oldham electric cap lamps were used, although flame safety lamps were provided for the firemen and for gas testing. The method of working was stoop and room, but the extraction of stoops had not begun and the workings were all in the solid. The roads could not be termed wet but were distinctly damp. Nearly at the return end of the section at the top of a gently rising road, called Young's Road, was McKnight's place, which had been driven to the right, and had passed four yards through a fault. For five days before the accident, accumulations of gas at the fault had been reported by the fireman and on each occasion the accumulation was removed. McKnight's place was ventilated by means of air led in by a brattice partition, but the face was a considerable distance from a through ventilation and the air had to be coursed a distance of about 220 yards by the brattice cloth in order to ventilate the straight road and a place to the left as well as McKnight's place. On the Thursday before the explosion a hand fan was placed behind the brattice about 20 yards from the face and was operated occasionally. On the Saturday morning there was again an accumulation of gas at the fault. Nine rhones had to be put on to the fan to carry the ventilation to the gas. From Saturday morning until Sunday night there was no one in the place to work the fan and firedamp without doubt again gathered at the fault. Since one of the victims was the fireman who should have inspected the workings before admitting the men, and since he failed to make his statutory report, it is not possible to prove what was the condition of the place, but it is conjectured that he instructed the men to use the fan to clear the gas out. At 11 p.m. the Sunday night shift descended and three workmen went into McKnight's place. Soon afterwards two men working on the main road noticed a heavy blast of air and became alarmed. They fetched two shaftsmen and went towards McKnight's place, but before they got there they met the fireman, Alexander Rodman, who had apparently been trying to get into the place. There was a large quantity of smoke in the air and through this smoke Rodman and one of the shaftmen, William Stevenson, went in a heroic attempt at rescue and were never seen alive again. Ultimately the Superintendent of the Kilmarnock Rescue Station, Mr Joseph Bryce, and the son of Alexander Rodman, wearing "Proto" Apparatus, recovered the bodies. All had died from carbon monoxide poisoning and the three miners who were in the explosion were burnt also, but not sufficiently to cause death. It was subsequently found that there had been a firedamp explosion, which had lighted three canisters of Bobbinite. One of the canisters had been taken in by the deceased men, but the other two had been wrongfully left in the mine over the week-end. The oil safety lamps were found opened and placed in position on a ledge of bottom coal, as if someone had been in the act of relighting them. Matches and cigarettes were discovered in a jacket at the end of McKnight's road. (b) The striking of a match to relight both lamps. The lamps were found on the intake side of the brattice about two yards from the fan, but the person lighting the lamp would have to be on the other side and the brattice screen would be parted at that spot. It was presumed that whilst the lamps were being opened by one person, another one was revolving the hand fan. Gas would be driven from the fault back to where the brattice was parted and would pass through the opening owing to the suction of the fan intake. It would thus be drawn on to the naked light. The finding of matches and cigarettes, together with the fact that the fireman's lamp was found not locked, pointed to a lack of discipline. There were many other indications confirming this. Legal proceedings were taken against the Manager and Under-Manager, and each was fined £5. The Sheriff Principal, who personally heard the case, decided that it is not compliance with Section 29 (1) to ventilate the mine generally while leaving individual places without ventilation adequate to dilute and render harmless noxious and inflammable gases. If, therefore, such places as cross measure or other drifts, single coal places, or even districts require auxiliary fans, whether hand or power driven, to keep them properly ventilated, such fans must be worked throughout the week-ends. The courageous actions of Alexander Rodman and William Stevenson, who lost their lives, and of Philip Rodman, who had the distressing experience of recovering his father's body, were recognised by the Carnegie Hero Trustees . In recognition of the distinguished but unavailing attempt by Alexander Rodman and William A. Stevenson to rescue three of the victims of the Kirkstyle Pit explosion on 18th January, in which attempt they unfortunately lost their lives, the Trustees of the Carnegie Hero Fund made posthumous awards of a memorial certificate, a headstone for the grave, and an allowance of £1 per week to the dependents of each man. The names of the men were inscribed on the Roll of Heroes. Pit Explosion - Five Dead In Ayrshire Disaster - Heroic Rescue Attempt - By an explosion of gas in Kirkstyle Pit Kilmarnock yesterday morning five lives were lost. The pit is situated in the lower end of the town, the pithead overlooking the playing pitch of the Kilmarnock Cricket club, and it is owned by the Portland Colliery Company (Ltd.), which also owns the Mersey Pit, on the west side of the burgh, and the Wellington Pit at Crookedholm, between Kilmarnock and Hurlford. Eight men started work on the night shift at Kirkstyle Pit on Sunday night at eleven o'clock. Three of them were engaged in the Major coal seam and other four in the Tounha' seam, the eighth man being the fireman, who had gone down first to make the ordinary inspection of the working places before operations began. Great Inrush of Air - The explosion occurred in the Major coal seam. The first, and indeed the only, indication of anything being wrong was a great inrush of air to the pit bottom. William Stevenson, sen., miner, 30 New Street, Riccarton, who was at work in the Tounha' seam along with his son, William Stevenson, jun., and another miner, named Michael Robertson, proceeded to the top and obtained lamps, and the three of them then proceeded to the Major coal seam. On approaching the scene of the accident the senior Stevenson told the others to keep back till he would go in to the working place and see what was wrong. Stevenson did not return, and the others went for further assistance. Several miners who live in the neighbourhood of the pit were roused, and quickly appeared on the scene. There was still no sign of the senior Stevenson, and, the worst being feared, word was sent to the Rescue Station at Kilmarnock for a contingent of rescue men. William Stevenson, sen., 30 New Street, Riccarton. The two Campbells and Cree were very badly burned all over, and it is believed that their deaths were due to burning and shock. Overcome By Blackdamp - There seems to be no doubt that Rodman and Stevenson lost their lives in a heroic endeavour to save or succour their fellow workers. They were found lying faces downward, not burned in any way, and it is almost a certainty that they were overcome by black-damp in attempting to reach their comrades Dr James Hamilton, of Hurlford was summoned, but unfortunately his services were of no avail. On his way home the doctor conveyed the distressing intelligence to the Rev. W. Somerville Reid, M.A., Reid U.F, Church, Hurlford, who undertook the melancholy task of breaking the news to the relatives of the unfortunate men. Probably the best-known of the victims was William Campbell, who played as a full back in the Hurlford football team for many seasons. His son who perished along with him was the oldest of a family of five. William Stevenson was widely known in the lower end of the town. He was a noted bowler, having won numerous prizes on Riccarton green, at which he was the champion for two seasons. In his younger days he played football, and was also an enthusiastic quoiter, having been connected with the Riccarton Wallace Club. He has left a widow and a family of five. William Rodman, the fireman, was a widower, resided with a married daughter. Mrs Alexander. All the members of his family arc grown up and married. Alexander Cree was unmarried, and resided with his parents.